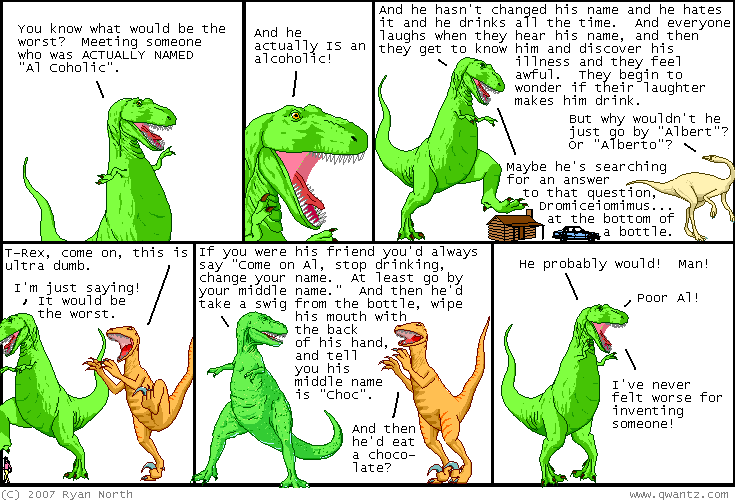 Dinosaur Comics - December 6th, 2007 - awesome fun times! December 6th, 2007: I put up the winter footer the other day. It's finally started snowing in Toronto! The snow is happy sign because it's when the heat gets turned on in my apartment. Many people emailed me about the penguin / tiger comic from last week, saying that this had actually been done with lions in Ireland in 2001 by punks who broke into a zoo. That's - that's less awesome. HEY check this out! More dinosaurs with preserved soft tissue! One year ago today: PALAEONTOLOGY NOTE: t.rexes did actually have ears. they didn't have pinnae, which are the external flaps of skin you're probably thinking of when you say 'ears'!